Because for days I have written nothing on this particular bit of screen, I think I shall have to write a couple of things in quick succession. I have a cup of tea, poised to my left, there should always be tea. The main thing to say is that the whole launch thing went very well. 100 people came, looked, listened, mingled and cleared us out of the all the tortilla chips and books we could fit on tables. Scott also sold 5 paintings (to date/at time of writing) Hungary, A Woman, Love Poem to Botticelli, Incanto and Prayer. The exhibition stays up until Oct 18th and I am tomorrow dropping a shoe box of ten more books to Attenborough Arts Centre as people have apparently been wanting to buy them, hurrah! I am particularly proud of the shoe box. It presents innocently enough but once contained a pair of black brogues, compressed moonlight about the faces, cloth roses, tiny as texture, dark as night. 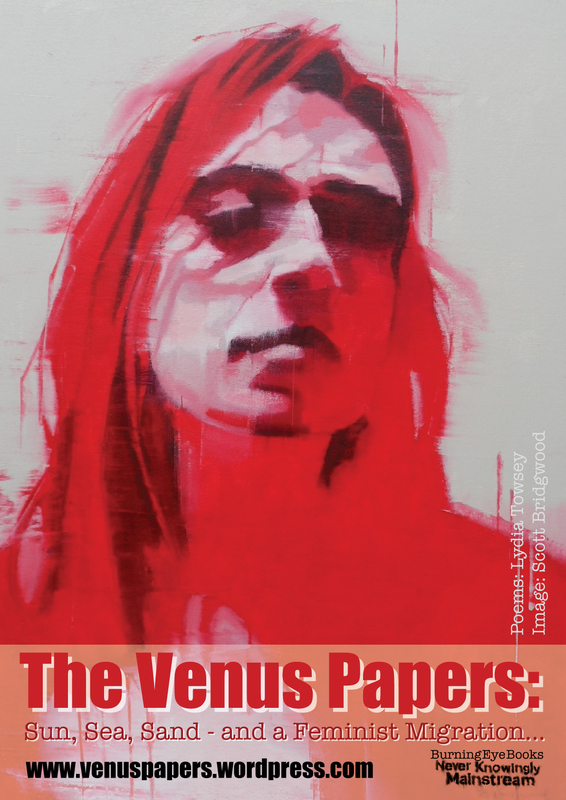 On the lid of the box I have cello- taped a blood red Venus flyer. The shoe box itself is snow white, putting me in mind of the fairytale femme fatale herself, rustling to a string quartet accompaniment. It is a good shoe box. I am sure the front of house staff of the Attenborough Centre will immediately recognise its quality. He will leave a small supply of these next to my shoe box. Even rolled, they would never fit into a shoe box, not even one of those long ones, the ones that look a bit like shoe boxes, but aren’t at all. Very good of them to say. All power and nice things to their elbows.